Salvage operations at Lorenz. Norman K. Linn photo. 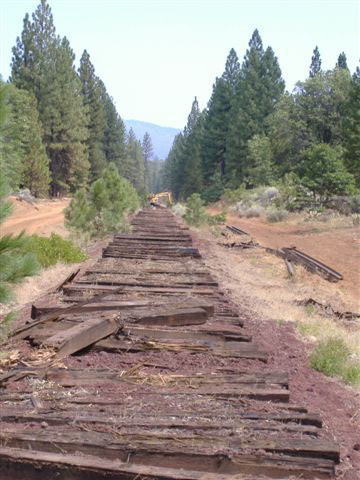 Two years and three weeks after the last revenue freight train operated to Burney, the salvage of the railroad east of McCloud has begun. The contractor, Mathison Railroad Services of Spencer, Nebraska, started work in the Burney area during the week of 21 July. This section of the site will provide periodic updates and photos of the salvage efforts as they become available. Click on the links below for photos and information.